Manufacturer & Trader of Lap Swimming Pools. Our product range also comprises of Swimming Pools, Indoor Swimming Pools and Infinity Swimming Pools. In our series of swimming pools, we are also offering a quality range of Lap swimming Pools to meet the demands of our clients. High quality materials are utilized while manufacturing these pools. Moreover, new styles and innovative techniques are used while fabricating these pools. These pools are used by swimming professionals. The looks of these pools are highly elegant and impressive. 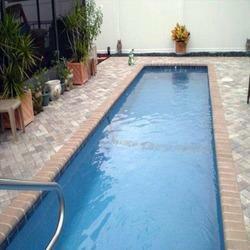 Looking for Lap Swimming Pools ?